Our season is late April, early May through late September. Full day fishing charters leave the Port Washington Harbor before dawn, and return to the dock between 1:00 and 2:00 pm. Half day charters are from early dawn to about 11:00 am and about 3:30 pm till just before dark or so. Call to make reservations or to set up your own times and dates. Multiple charters may be discounted. In June and July we travel farther off shore to the deeper waters and fishing grounds for lean powerful Lake Trout and Coho as they follow baitfish and cooler water. Out in deeper water is where we find thermal bars down a little deep, or bug lines on the surface of the Lake, as the Lake Trout, Salmon and Steelhead school-up out here. There is plenty of action our here in “the deeps” and 20 fish on in a day is common. North America, coho salmon is a game fish in fresh and salt water from July to December, especially with light fishing tackle. 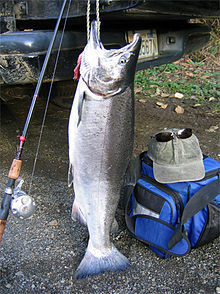 It is one of the most popular sport fish in the Pacific Northwest of the United States and Canada. Its popularity is due in part to the reckless abandon which it frequently displays chasing bait and lure while in the lakes, and the large number of coastal streams it ascends during its spawning runs. Its habit of schooling in relatively shallow water, and often near beaches, makes it accessible to anglers on the banks, as well as in boats.